Many years ago, photographer Judy Lovell graciously allowed me to use her photo of Plato the Pelican in one of my blog posts. I’m as fond of Plato as Judy, and still enjoy seeing him from time to time. I never imagined I would find a bird equally striking, but in January of this year I discovered this crested caracara sitting on a fence post at the Aransas Wildlife Refuge. Initially, I thought to name him Cicero, just for the sake of alliteration: Cicero the Caracara does have a bit of a ring to it. But every time I look at him I laugh, so Aristophanes it is. Not only was Aristophanes (c. 450 bce – c. 388 bce) a great comic playwright, one of his finest plays still is enjoyable and amusing. It’s title? The Birds. Isn’t he fun? I love the orange face and blue beak. I wondered where that fancy name came from! I see in your link, that The Birds is reckoned to be his “most delightful” play, I’d be curious to see it sometime. I also looked up a caracara, never saw one around here, of course, pretty neat bird! Wonderful crystal-clear photo, it’s almost like Aristophanes glued on a fluffy white beard for one of his plays. I’ve never seen The Birds produced, but it received this great review when the Greek Theater of New York presented their version in 1983. I first heard the phrase “blue nose” as a reference to Puritans. Later, I learned about the famous Canadian ship, “Blue Nose,” which was named in honor of the Nova Scotians. It hadn’t occurred to me that the expression “blue laws” is related, but so it is (to the Puritans, not the Nova Scotians). Great portrait, Linda! I’ve always thought CCs to be beautiful birds, but I also think that of the vulture too. His given name sure fits. There are more of them around than I’ve realized. I found one just walking down the road the day I discovered this fellow on the fencepost. He made me laugh, too. He looked for all the world like someone just out for a stroll, and he was pretty darned handsome himself. That’s a strikingly direct portrait. You’re fortunate the bird held still long enough for you to take at least this one picture. The American Heritage Dictionary says that caracara comes from the Tupí language of South America. I’ve found that using the car as a mobile bird blind can work well. There are limitations — in this case, I couldn’t find a way from inside the car to get an unobstructed view of the whole bird — but a partial view is better than none. I did a little research on caracara recently, because my favorite orange has appeared in the markets, and it’s named Cara Cara. I found the variety is a mutation that occurred on a Washington navel orange tree, and that it was was discovered in 1976 at Hacienda Cara Cara in Venezuela. I haven’t been able to find any information about the naming of the hacienda, though. I searched a bit but didn’t find anything about the name of the hacienda. I assume it was named after the bird. Probably so. It’s certainly a nice name. It’s also a play on words in Spanish, cara being the female form of the adjective that means ‘dear.’ It corresponds to French chère. That’s a super portrait, and well-named! Love it! Thanks, Terry. Every time I look at him, I chuckle at that name. He is a handsome fellow — I’m so pleased I could get such a nice, close view. Extraordinary! You are so macro, the next step will be his brain! The name fits him. Notice his eyes; he seems not to be looking at me and the camera, but at something else higher in the sky. Perhaps that’s why I was able to get so close. His brain might have been occupied with other thoughts and he wasn’t paying me any mind, as the saying goes. Better Deep Thoughts than Shallow Sentiments, I suppose. They do have wonderfully expressive faces. Love your irony here with new found friend!! How could I look at this wonderful creature and not give him a name? He seemed to deserve one! He looks to be a strict taskmaster. I better sit up straight, do my home-work, and help mum make the bed. Thanks, Vicki. It’s great fun to be able to get up-close-and-personal now and then. “Aristophanes” suits him. Despite his burnsides, he does have a certain gravitas, It seems very appropriate that the owner of such a beak be named after a playwright noted for his biting wit. Good one — and Aristophanes could bite, there’s no question about that. That blue beak is so vivid, I wondered if it might be part of the changes that come with mating season, like the feathers on egrets and herons. Yet another question to be answered. 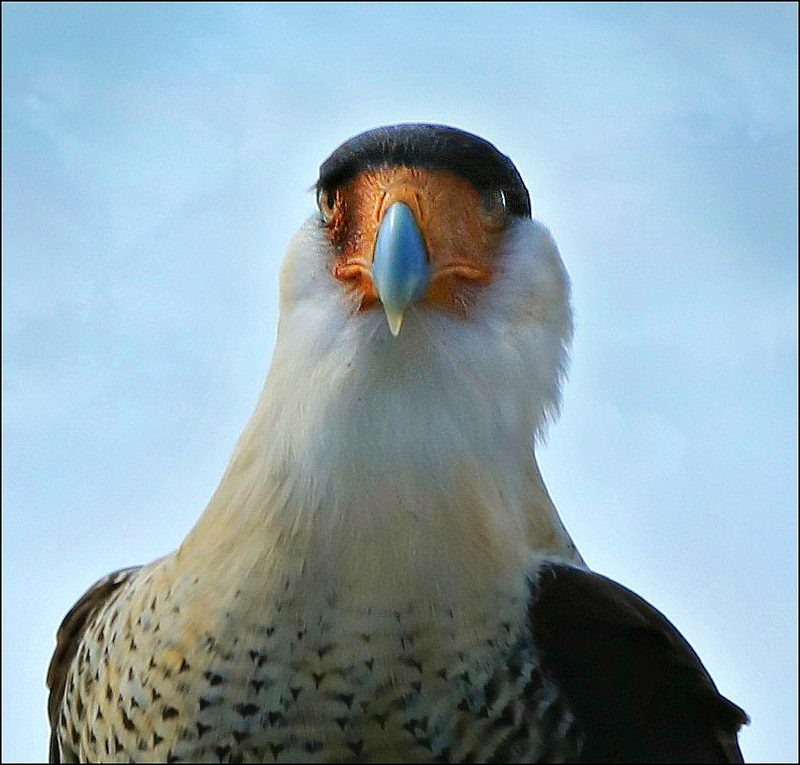 Gee the caracara is vey regal and what a great and lucky shot. It seems you have found the perfect place for photographing. Once the flowers begin appearing, I’ll have many more choices for “camera days,” but right now, the birds are the thing, and this is the closest place to find a nice variety. Even so, it can be unpredictable. I went down yesterday, but the day was so flat and gloomy, even the birds seemed to have decided to keep a low profile; there were very few out and about. Still, there’s always something to admire. Yesterday, it was the first Texas dandelion I’ve seen this year. What a majestic BIG bird! He rather looks like he’s wearing a cap … or maybe a toupee! Nice seeing something other than snow for a change, ha! He is a big one, for sure: about the size of a vulture. His head feathers are so smooth and slicked-up, he does look like he’s just been to the bird grooming salon, doesn’t he? I’m sure you’re ready for something besides snow. I saw my first dandelions this weekend: two native, and one European. It’s not much, but it’s a start! You know, Linda, I think I might even welcome dandelions at this time of year! Winter is impossibly cruel — though I suppose we’re due for a harsh one, after the light ones we’ve had previously. We’re in the same situation. After some relatively mild winters, it’s been what people here are calling “a real winter.” But even if there aren’t many guarantees in life, it is guaranteed that spring will arrive: eventually. Oh, yeah. He’s Aristophanes for sure. You do know that Aristophanes wrote “The Birds,” don’t you? Of course you do! And “The Frogs” and “The Clouds” and my favorite, “Lysistrata.” I think that’s a perfect name! I do know that Aristophanes wrote The Birds. That’s why I included that little tidbit in the last paragraph of the post, with a link to the play. I think the name’s perfect, too. Of course, every time I hear the playwright’s name from now on, I’ll think of this Caracara, but that’s not the worst thing in the world! By the way — the women of Liberia went Lysistrata on their men during the recent civil war. Have you seen the film Pray The Devil Back to Hell? It’s a powerful and occasionally humorous account of their efforts to bring peace. He’s lovely! I know I tend to sympathize with refuge birds. It was used as a lingua franca throughout Brazil by Europeans and Amerindians In the early colonial period, according to Wikipedia. jaguara, yaguara (Tupi) ‘jaguar’: JAGUAR is another one! And I just found ‘cayenne,’ ‘macaw,’ and ‘piranha’ to add to the list. Most interesting. Both Tupí and ‘Guarani’ (another one from Paraguay and Bolivia) are of course pre-colombian, so the ‘caracara’ allusion to ‘face’ (or other meanings) is mere coincidence, but it may have been the bird’s call too. It’s interesting how in this case the Jesuit missionaries too were involved in learning and teaching the languages and inevitably may have added Latin. It reminded me of the post you wrote on the missionaries with native Americans not too long ago. I’ve never heard a caracara make a sound, and from what I’ve read, they tend toward silence. But when they pipe up, the sound is unique, and it seems that their popular name somehow is related to that call. It sounds a bit like a rusty gate, to me. I know I read it somewhere but it may not be from a trustworthy source, but could be at least a possibility to exclude it from its resemblance to Spanish. This is fascinating. I know the anhinga; we have them here, and some locals call them the “water turkey.” Of course tapioca is familiar; I grew up eating tapioca pudding. And toucan, petunia, and jacaranda all are familiar. I think the tanagers only migrate through here, and of course we don’t have tapirs — but I’ve seen them on programs like National Geographic. You may have seen the other interesting note above. The Cara Cara orange, which is a new cultivar of the fruit (and my favorite) was named after Hacienda Cara Cara in Venezuela. Yes, I read it, amazing, it makes me wonder just how much of the Tupí language is in these names as opposed to mixed Spanish and Portuguese, which might have been introduced with the years. It must be confusing to trace all of these words. Linguistic journeys are as interesting as the journeys we take. Isn’t he something? I love the orange face and blue beak. I need to ask a more experienced birder if that beak might be brighter because it’s mating season. I don’t remember seeing such vivid colors before. Here’s an amusing detail about them: they love to walk, as well as fly. I have a photo of one walking down a road. I thought it was strange, but then I learned it’s common for them to do so. That is a very unique bird – a caracara – wow! the blue is pure and stunning,, and I’ll bet you have a series of great shots.. This one is for sure a winner! Only this one of him on the post, although a couple of his friends were roaming around on the road. I didn’t know until quite recently that they’re as willing to walk as to fly — and they can run. Apparently they can put on enough speed to run down small prey. The photos I have of one walking show its stride — long, confident, and purposeful. That’s a striking portrait! Even eyelashes…. And thanks for photographing a bird I’ve never seen outside of books – maybe someday! He looks so dignified in this photo, but they can appear quite humorous, too. They apparently enjoy walking — or running, which they do rather well — and when they set off on foot, it’s really something to see. The ones I’ve seen on foot have a long, determined stride, as if they know exactly where they’re going, and what they’re going to do. Sounds so cool – I’d love to see that!